The Methodist movement is a group of historically related denominations of Protestant Christianity which derive their inspiration from the life and teachings of John Wesley (1703-1791). It originated in eighteenth-century England, and due to vigorous missionary activity, it spread throughout the British Empire, the United States, and beyond. Methodism is respected around the world for its emphasis on helping the poor and the average person, its universal salvation aspect, and its very systematic approach to building the person, and the "church." Methodists are convinced that building loving relationships with others through social service is a means of working towards the inclusiveness of God's love and universal salvation in the church. They teach that Christ died for all of humanity, not just for a specific group, and thus everyone is entitled to God's grace. Theologically, this view is known as Arminianism, which denies that God has pre-ordained an elect number of people to eternal bliss whilst others perished eternally. Originally Methodism appealed to poor workers such as miners and farmers, and in the United States, it became the religion of many slaves. Methodism has often been low church in liturgy, even though its founder John Wesley was high church. The World Methodist Council Handbook of 2000 stated that the number of Methodist members worldwide was about thirty eight million. Methodism originated in England in the eighteenth century, among a group of men including John Wesley and his younger brother Charles. It was originally a movement within the Church of England focused on Bible study, and a methodical approach to scriptures and Christian living. The term “Methodist” was a pejorative nickname that was given to a small society of students at Oxford, who met together between 1729 and 1735 for the purpose of mutual improvement. They were accustomed (unusually, at that time) to attend a service of Holy Communion every week, to fast regularly and to abstain from most forms of amusement and luxury. They also frequently visited poor and sick persons and prisoners. Early Methodists reacted against perceived apathy in the Church of England, became open-air preachers and established Methodist societies wherever they went. They were known for their enthusiastic sermons and often accused of fanaticism. In those days, upper class members of the established church feared that the doctrines emphasized by the Methodists, such as Justification by Faith, and of the constant and sustained action of the Holy Spirit upon the believer's soul, would produce ill effects upon weak minds. Theophilus Evans, an early critic of the movement, even wrote that it was “…the natural Tendency of their Behaviour, in Voice and Gesture and horrid Expressions, to make People mad.” In one of his prints, William Hogarth likewise attacked Methodists as “enthusiasts” full of “Credulity, Superstition and Fanaticism.” But the Methodist movement thrived among the working class despite the attacks—mostly verbal, but sometimes violent—against it. John Wesley came under the influence of the Moravians and of the Dutch theologian Jacobus Arminius (1560-1609). Arminius (the Latinized form of the name Jakob Harmaens) denied that God had pre-ordained an elect number of people to eternal bliss whilst others perished eternally. An even more famous contemporary preacher, George Whitefield (1714-70), who like Wesley was at the heart of the evangelical revival, adopted Calvinist views. Consequently, their followers separated, those of Whitefield becoming Calvinistic Methodists. Generally, Methodists have followed Wesley in Arminian theology. John Wesley made three crucial contributions to the establishment of the Methodist movement. First, he believed that everyone could have a relationship with God that touched the heart as well as the mind. His conversion experience on May 24, 1738, in which he felt his heart to be “strangely warmed” may have been over-exaggerated by some followers, but it has left a strong impression on later followers and it resonated strongly with many people in his own day who felt alienated from the formal religion of much of the Church of England. Secondly, he was a brilliant organizer and, in his travels throughout the British Isles beginning in the late 1730s, Wesley set up societies of committed Christians in many places, including lay people whom he licensed to preach. He organized members into classes, where they met for bible study and confessed their sins. Finally, although he never left the Church of England, Wesley came to believe that the New Testament evidence did not leave the power of ordination to the priesthood in the hands of bishops, but that other priests could do ordination. In 1784, he ordained preachers for Scotland and England and America, with power to administer the sacraments. This was a major reason for Methodism's final split from the Church of England after Wesley’s death. This split created a separate, eventually worldwide, series of church denominations. Traditionally, Methodism has emphasized the Arminian view of free will, mediated through God's prevenient grace, as opposed to predestination. This distinguishes it, historically, from Calvinist traditions such as Presbyterianism. 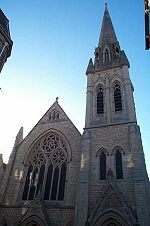 However, in strongly Calvinist areas such as Wales, Calvinistic Methodists remain, also called the Presbyterian Church of Wales. Also, more recent theological debates have often cut across denominational lines, so that theologically liberal Methodist and Reformed churches have more in common with each other than with more conservative members of their own denominations. John Wesley was not a systematic theologian, though Methodist ministerial students and trainee local preachers do study his sermons for his theology. He is known for his practical sayings like "earn all you can, save all you can, and give all you can" and "cleanliness is next to godliness." Another popular expression of Methodist theology is found in the hymns of Charles Wesley. Since enthusiastic congregational singing was a part of the Evangelical movement, Wesleyan theology took root and spread through this channel. Methodism follows the traditional and near-universal Christian belief in the triune God-Father, Son, and Holy Spirit. In devotional terms, this confession is said to embrace the biblical witness to God's activity in creation, encompass God's gracious self-involvement in the dramas of history, and anticipate the consummation of God's reign. Methodists, like most Protestant denominations, affirm that there are two Sacraments: Baptism and Holy Communion. It is a traditional position of the Methodist Church (as of many others) that any disciplined theological work calls for the careful use of reason by which to understand God's action and will, especially from reading the Bible. Methodists have also emphasized the importance of Scriptural holiness, which entails more than personal piety; love of God is always linked with love of neighbor, a passion for justice and renewal in the life of the world. John Wesley made much of the process of sanctification, occasionally even seeming to claim that individuals could achieve Christian Perfection in this human life. But often he drew back from such a position. Even many Methodists think that he claimed too much for sanctification. However, the positive aspect of this belief is its emphasis upon personal and social holiness. Wesley was (unusually for his time) well read in the fathers of the Eastern Orthodox churches, some of whom had stressed the possibility of theiosis: becoming God-bearing towards other people and all creation. It can be claimed that, in a small way, Methodism has reclaimed this Eastern doctrine for Protestant Churches in the modern and contemporary world. In liturgical matters, most Methodist worship is modeled after the Book of Common Prayer. A unique feature of the American Methodist Church is the observance of the season of Kingdomtide, which encompasses the last 13 weeks before Advent, thus dividing the long season after Pentecost into two discrete segments. During Kingdomtide, Methodist liturgy emphasizes charitable work and alleviating the suffering of the poor. …Christ has many services to be done. Some are easy, others are difficult. Some bring honour, others bring reproach. Some are suitable to our natural inclinations and temporal interests, others are contrary to both... Yet the power to do all these things is given to us in Christ, who strengthens us. …I am no longer my own but yours. Put me to what you will, rank me with whom you will; put me to doing, put me to suffering; let me be employed for you or laid aside for you, exalted for you or brought low for you; let me be full, let me be empty, let me have all things, let me have nothing; I freely and wholeheartedly yield all things to your pleasure and disposal. Schisms within the original Methodist church, and independent revivals, led to the formation of a number of separate denominations calling themselves Methodist. The largest of these were the Primitive Methodist church, deriving from a revival at Mow Cop in Staffordshire, the Bible Christians and the United Methodist Church (not connected with the American denomination of the same name, but a union of three smaller denominations). The original church became known as the Wesleyan Methodist Church to distinguish it from these bodies. The three major streams of British Methodism united in 1932 to form the current Methodist Church of Great Britain. In the 1960s, the Methodist Church made ecumenical overtures to the Church of England, aimed at church unity. Formally, these failed when they were rejected by the Church of England's General Synod in 1972; conversations and co-operation continued, however, leading in 2003 to the signing of a covenant between the two churches. From the 1970s onward, the Methodist Church also participated in several "Local Ecumenical Projects" (LEPs) both with the Church of England and with the United Reformed Church, which involved sharing churches, schools and in some cases ministers. Traditionally, Methodism proved particularly popular in Wales and Cornwall, and in the northeast of England, regions noted for their non-conformism and distrust of the Church of England. However, even in these areas, the British Methodist Church is in steep decline, like most mainstream British churches. Between 2001 and 2004, national Methodist membership fell by 9.7 percent . The First Great Awakening was a religious movement in the 1730s and 1740s, beginning in New Jersey, then spreading to New England, and eventually south into Virginia and North Carolina. The English Methodist preacher George Whitefield played a major role, traveling across the colonies and preaching in a dramatic and emotional style. The first American Methodist bishops were Thomas Coke and Francis Asbury, Ashbury's boyhood home, Bishop Asbury Cottage, in West Bromwich, England, is now a museum. Upon the formation of the Methodist Episcopal Church in America at the Baltimore Christmas Conference Christmas Conference in 1784, Coke (already ordained in the Church of England) ordained Asbury a deacon, elder, and bishop each on three successive days. Circuit riders, many of whom were laymen, traveled by horseback to preach the gospel and establish churches in many places. One of the most famous circuit riders was Robert Strawbridge who lived in the vicinity of Carroll County, Maryland soon after arriving in the Colonies around 1760. The Second Great Awakening of the late 1820s and 1830s was a nationwide wave of revivals. In New England, the renewed interest in religion inspired a wave of social activism among Yankees; Methodism grew rapidly and established several colleges, notably Boston University. In the "burned over district" of western New York, the spirit of revival burned brightly. Methodism saw the emergence of a Holiness movement. In the west especially at Cane Ridge, Kentucky and in Tennessee, the revival strengthened the Methodists and the Baptists. Disputes over slavery placed the church in difficulty in the first half of the 1800s, with the northern church leaders fearful of a split with the South, and reluctant to take a stand. The Wesleyan Methodists (which later became The Wesleyan Church) and the Free Methodist Churches were formed by staunch abolitionists, and the Free Methodists were especially active in the Underground Railroad, which helped to free the slaves. Finally, in a much larger split, in 1845 at Louisville, the churches of the slaveholding states left the Methodist Episcopal Church and formed The Methodist Episcopal Church, South. The northern and southern branches were reunited in 1939, when slavery was no longer an issue. The Methodist Protestant Church also joined this merger. Some southerners, conservative in theology, and strongly segregationist, opposed the merger, and formed the Southern Methodist Church in 1940. The Third Great Awakening from 1858 to 1908 saw enormous growth in Methodist membership. Methodists were often involved in the Missionary Awakening and the Social Gospel Movement. The awakening in so many cities in 1858 started the movement, but in the North it was interrupted by the Civil War. In the South, on the other hand, the Civil War stimulated revivals, especially in Lee's army. The United Methodist Church was formed in 1968 as a result of a merger between the Evangelical United Brethren and the Methodist Church. The former church had resulted from mergers of several groups of German Methodist heritage. The merged church had approximately nine million members as of the late 1990s. While United Methodist Church in America membership has been gently declining , associated groups in developing countries are growing rapidly. American Methodist churches are generally organized on a connectional model, related but not identical to (and spelled differently from) that used in Britain. Ministers are assigned to churches by bishops, distinguishing it from presbyterian government. Methodist denominations typically give lay members representation at regional and national meetings (conferences) at which the business of the church is conducted, making it different from episcopalian government. This connectional organizational model differs further from the congregational model, for example of Baptist, and Congregationalist Churches, among others. In addition to the United Methodist Church, there are over 40 other denominations that descend from John Wesley's Methodist movement. Some, such as the African Methodist Episcopal Church, the Free Methodists and the Wesleyan Church (formerly Wesleyan Methodist), are explicitly Methodist. Others do not call themselves Methodist, but grew out of the Methodist movement: for example, The Salvation Army and the Church of the Nazarene. Some of the charismatic or pentecostal churches such as the Pentecostal Holiness Church and the Assemblies of God also have roots in or draw from Wesleyan thought. The Holiness Revival was primarily among people of Methodist persuasion, who felt that the church had once again become apathetic, losing the Wesleyan zeal. Some important events of this revival were the writings of Phoebe Palmer during the mid-1800s, the establishment of the first of many holiness camp meetings at Vineland, New Jersey in 1867, and the founding of Asbury College, (1890), and other similar institutions in the U.S. around the turn of the twentieth century. From its beginnings in England, Methodism laid emphasis on social service and education. Numerous originally Methodist institutions of higher education were founded in the United States in the early half of the nineteenth century, and today altogether there are about twenty universities and colleges named as "Methodist" or "Wesleyan" still in existence. The United Methodist Church allows for a wide range of theological and political beliefs and both prominant Republicans and Democrats have been members. An estimated 75 million people worldwide belong to the Methodist community. In Australia, the Methodist Church merged with the majority of the Presbyterian Church of Australia and the Congregational Union of Australia in 1977, becoming the Uniting Church. The Wesleyan Methodist Church of Australia continues to operate independently. There are also other independent Methodist congregations. Some of these were established by, or have been impacted by, Tongan immigrants. In Canada, the Methodist Church of Canada was an 1884 union of pioneering groups. In 1925, they merged with the Presbyterians, then by far the largest Protestant communion in Canada, most Congregationalists, Union Churches in Western Canada, and the American Presbyterian Church in Montreal, to form the United Church of Canada. In 1968, the Evangelical United Brethren Church's Canadian congregations joined after their American counterparts joined the United Methodist Church. Missionaries from Britain, North America, and Australia founded Methodist churches in many commonwealth countries. These are now independent and many of them are stronger in church attendance than the former "mother" churches. In addition to the churches, these missionaries often also founded schools to serve the local community. A good example of such a school is the Methodist Boys' School in Kuala Lumpur, Malaysia and The Anglo-Chinese Schools, Methodist Girls Schools and Fairfield Methodist Schools in Singapore. Almost all Methodist churches are members of a consultative body called the World Methodist Council, which has its headquarters at Lake Junaluska, North Carolina, U.S.A. The Igreja Metodista Unida is one of the largest denominations of Mozambique. Although Methodism is declining in Great Britain and North America, it is growing in other places; at a rapid pace in, for example, South Korea. In these new places, it often takes shapes that diverge from its roots. For example, the Arminian heritage is ignored or simply unknown, and an exclusive, neo-Calvinist emphasis is played up, consigning members of other religions and sometimes even other sorts of Christians to eternal damnation. Many such churches highlight Methodism’s traditional emphasis upon holiness; outsiders could sometimes be forgiven for thinking that it looks more like self-righteousness than the sanctification proclaimed in John Wesley’s theology and Charles Wesley’s hymns. Still, such churches display an exuberance and excitement and growth that characterized the earliest days of the Methodist movement. The longer-established churches in Great Britain and North America have made two important contributions to the universal church in recent years. Many Methodists have been involved in the ecumenical movement, which has sought to unite the fractured denominations of Christianity. Because Methodism grew out of the Church of England, a denomination from which neither of the Wesley brothers seceded, some Methodists have regarded their ‘movement’ more as a preaching order within wider Christian life than as a church, comparing themselves with, say, the Franciscans, who formed a movement within the medieval European church and not a separate denomination. (Rupert Davies’s book, "Methodism" makes much of this idea.) Certainly, Methodists have been deeply involved in early examples of church union, especially the United Church of Canada and the Church of South India. Also, a disproportionate number of Methodists take part in inter-faith dialogue. For example, Wesley Ariarajah, a long-serving director of the World Council of Churches’ sub-unit on Dialogue with People of Living Faiths and Ideologies is a Methodist. Indeed, many of the great names in the field of inter-religious relationships over the past century have been Methodists, including: Edwin Smith, William Simpson, Geoffrey Parrinder, Kenneth Cracknell, Diana Eck, and many others. The Arminian heritage of Methodism has been important to them, which they have sung in Charles Wesley’s hymns that have been intoxicated with the universal love of God. It is not that these dialogue practitioners believe that any and every claim to the knowledge of God should be accepted, as some of their critics have asserted. Rather, it is their belief that Christ died for all, not for the few. They are convinced that the church, like their movement, is a means of pointing to the inclusive love of God, not an end in itself. Cracknell, Kenneth and Susan J. White. 2005. An Introduction to World Methodism. Cambridge: Cambridge University Press. ISBN 0521818494. Davies, Rupert E. 2003. Methodism. Presbyterian Pub. Corps. Swarthmore College Peace Collection: List of CPS Camps (by Camp Number), retrieved Jan. 25, 2006. Richey, Russell E., et al. (eds.). 2000. The Methodist Experience in America: A Sourcebook. Sweet, William Warren, ed. 1946. Religion on the American Frontier: 1783-1840, Vol. IV. The Methodists: A Collection of Source Materials. ISBN 0815402252. Harmon, Nolan B. (ed.). 1974. The Encyclopedia of World Methodism. Abingdon Press. Heitzenrater, Richard P. 1994. Wesley and the People Called Methodists. Hempton, David. 1984. Methodism and Politics in British Society, 1750-1850. Hempton, David. 2005. Methodism: Empire of the Spirit. Kent, John. 2002. Wesley and the Wesleyans. Cambridge: Cambridge University Press. Warner, Wellman J. 1930. The Wesleyan Movement in the Industrial Revolution. Campbell, James T. 1995. Songs of Zion: The African Methodist Episcopal Church in the United States and South Africa. New York: Oxford University Press. George, Carol V. R. 1973. Segregated Sabbaths: Richard Allen and the Rise of Independent Black Churches, 1760-1840. Montgomery, William G. 1993. Under Their Own Vine and Fig Tree: The African-American Church in the South, 1865-1900. Walker, Clarence. 1982. A Rock in a Weary Land: The African Methodist Episcopal Church During the Civil War and Reconstruction. Wills, David W. and Richard Newman (eds.). 1982. Black Apostles at Home and Abroad: Afro-American and the Christian Mission from the Revolution to Reconstruction. Cameron, Richard M. (ed.). 1961. Methodism and Society in Historical Perspective. 4 vols. Meyer, Donald. 1988. The Protestant Search for Political Realism, 1919-1941. Wesleyan Univ. Press. Miller Schmidt, Jean. 1996. Grace Sufficient: A History of Women in American Methodism, 1760-1939. Wigger, John H. 1998. Taking Heaven by Storm: Methodism and the Rise of Popular Christianity in America. New York: Oxford University Press. This page was last modified on 29 August 2008, at 14:46.